Are you connected to your water feature? Sounds like an odd question? You might think I’m heading in the direction of getting you re-connected to nature. You know what I mean, how in today’s world we have a shortage of nature in our daily lives and having a water feature is a great way to remedy that problem. If you have children, your water feature can be their connection to nature as an outdoor classroom to study the eco-system without them even knowing it. All of that would make a good article however that’s not the direction I was heading. Instead, I was just curious if your current water feature has a Wi-Fi connection? Now I bet I have your attention, you didn’t think your water feature needed a Wi-Fi connection did you? Well in today’s world who would expect anything else? With the addition of two new Atlantic Water Garden products your water feature can join the high tech world. 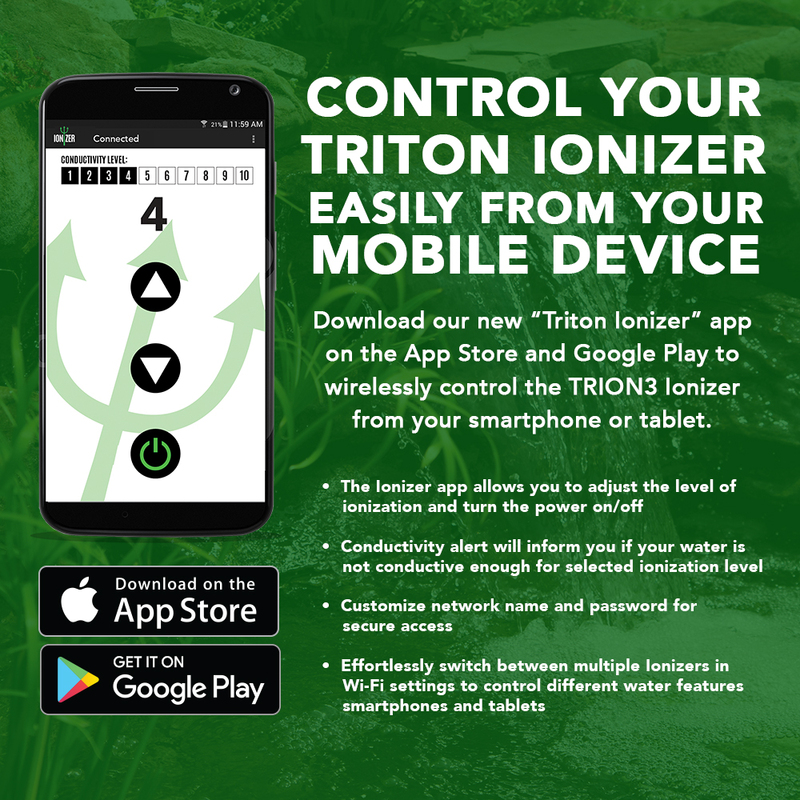 Atlantic’s Triton Ionizer and pump variable speed control both have their own Wi-Fi connection making your life that much easier and your water feature more interactive. 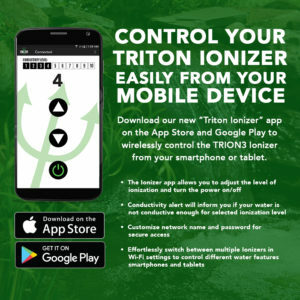 The Triton Ionizer ionizer is designed to mineralize the water helping keep water features clean and clear without the use of harsh chemicals and is safe for fish. The unit can be controlled manually from the front panel or by the use of the ionizer mobile Application for iPhone or Android devices. 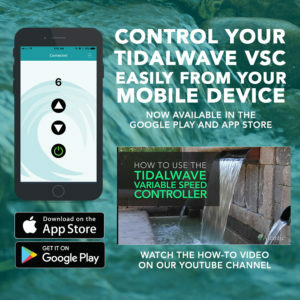 The TidalWave VSC allows you to vary the output of Tidal Wave TT & TW-Series Asynchronous pumps wirelessly by remote control or mobile app! The VSC allows you to set both on and off times as well as drop to 25% of the total flow in 10 levels of adjustment giving you the ultimate control over water flow. Both of these products make life with a water feature more enjoyable. Previously the downfall has always been the effort to disguise them into the landscape during installation usually ending up in a location that is tough to access. With the new connect ability, you can hang out on the patio and play with your pond from your lounge chair. You see some debris in the waterfall, open the ionizer app and increase the level. Or the reverse can be true, you don’t see any debris in the water feature, open the app and lower the level of activity. The variable speed control is even a little more interactive, as your mood changes so can the desired flow of your waterfall. If you are having a party and want the waterfall to really put on a show, open the VSC app and turn up the volume or it could be a quiet afternoon on the patio, open the app and lower the volume a little. The VSC can also be programmed to control your feature with its on/off programmable timer. This is a nice little feature that helps you to save electricity and water by having it turn off when you are not around to enjoy it. So sit back in that lounge chair and visit www.atlanticwatergardens.com and learn how you can get better connected to your water feature! Sean is the Regional Sales Manager for the Southeast for Atlantic Water Gardens. 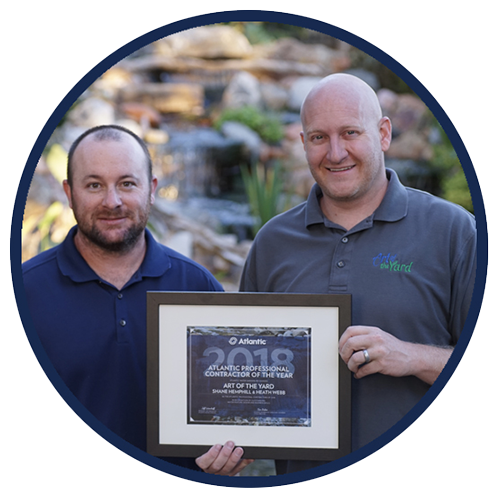 Fish Geek and water feature enthusiast, Sean has managed one of the largest aquarium stores in the Southeast while running his own pond maintenance company. When it comes to water features, Sean is your guy! Probably the number one question a prospective pond owner will ask is “what happens to to my fish in the winter? The quick answer is “not much”, but there is a little more to it than that. Truth is they really just slow down, some will say they hibernate, others will say that they go dormant, but it is more of a torpid state. Their body temperature is regulated by their surroundings, so as temperatures drop, so does their activity. On the coldest of days you will see them sitting on the bottom of the pond with their fins tucked in. If they could talk they would simply say they are waiting on spring. “Should I do anything for my fish?”,absolutely, but it’s probably not what you are thinking. Your fish are tough and can handle the elements on their own very well. But they do need you to help out in a minimal way. First thing is to feed them a good quality high fiber fall/spring fish food. Your fish do not handle food the way we do. They continually graze and eat to fill the pipeline. When temperatures drop, that food is stuck there to decay and cause issues in your fish. They can not empty their digestive tract after temperatures have dropped. Feeding should be stopped when water temperatures reach 55 degrees. Keep an eye on the weather, quit feeding at the 60 degree mark to be safe. If you live areas of the country that get big swings in temperature as fall approches, use your best judgement erroring on the side of caution. Next thing to consider is your fish really need is consistency. They can handle the lower temps but they really need it to be consistent. Make sure your pond is at the very least 2 feet deep. This will give them a safe zone to be in for the winter. The warmest water is the deepest and should not be disturbed. If you have a waterfall make sure that where it enters the pond is somewhat shallow. 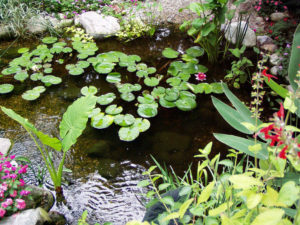 If the waterfall drops into the deepest section of the pond it will “mix” cooler water into the “safe” zone your fish are living in. Leaving your waterfall running in winter is fine to do as long as that cooler water is being pulled from the surface zone (using a pond skimmer) and being returned to the surface zone. Big temperature swings in your pond will stress your fish and lead to health issues. Lastly, is to make sure there is an open hole in the surface of the pond. 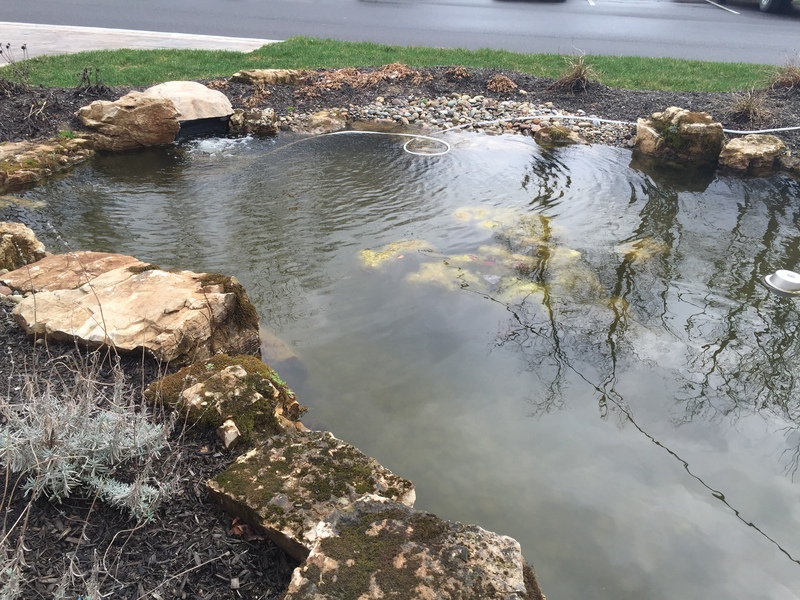 If you live in the colder climates, your ponds surface may freeze over completely. Even though our finned friends are not breathing as much as they normally do, they are still breathing. 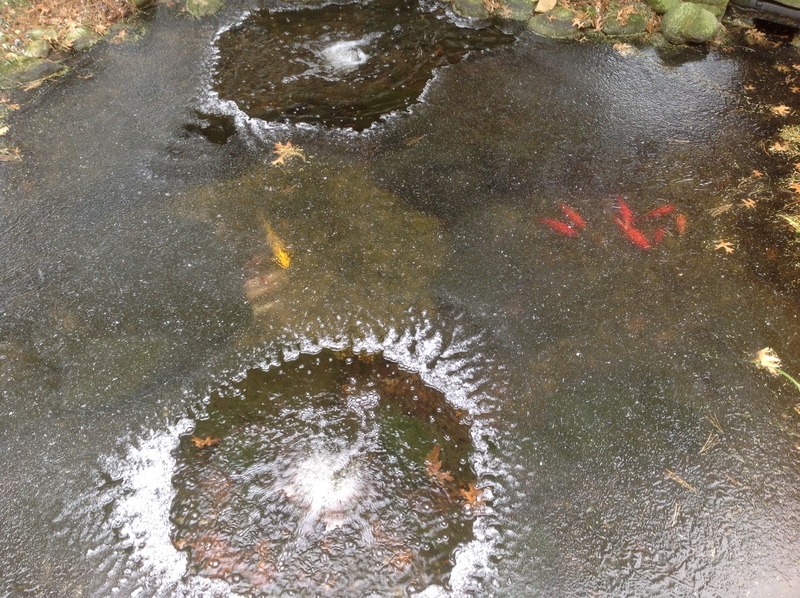 If the surface is completely covered in ice, harmful gasses can not escape and the pond can not re oxygenate as it normally does. Use a small pump or and air system to keep a hole open in the ice. Place the small pump on the upper shelf of the pond pointed to the surface. It should “bubble” above the surface. 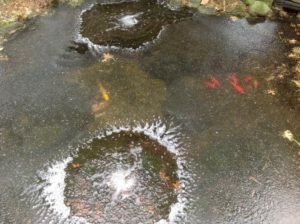 If you elect to use an air system (preferred), Place the air stones on the upper shelf of the pond. Both ways will help in keeping a hole in the ice. But do not put either the airstone or pump down in the safe zone. 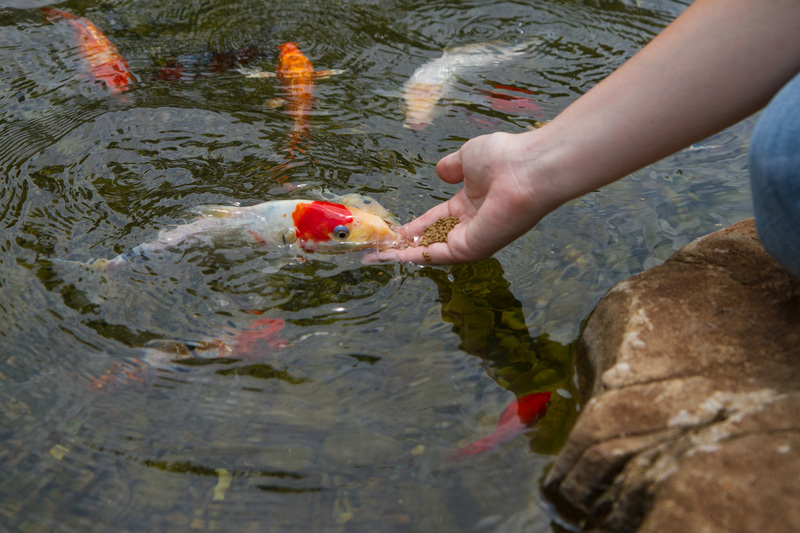 That would mix the warm water your fish are enjoying with the rest of the pond, thus leading to health issues. If you follow these simple ideas this winter your fish will do great and be ready for spring. As mentioned before, no feeding at 55 degrees and below. As spring starts to show, be sure temperatures are consistent before you start feeding again. Enjoy your pond this winter! A few months ago we started with the question that I hear more than most. That was, how does my pond work anyway? 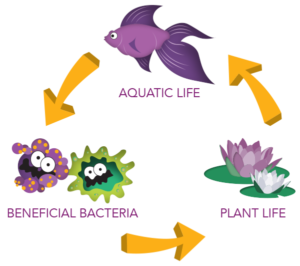 In that blog I gave the basics of the biology in your pond and even compared it to a goldfish bowl. Basically they work the same way. 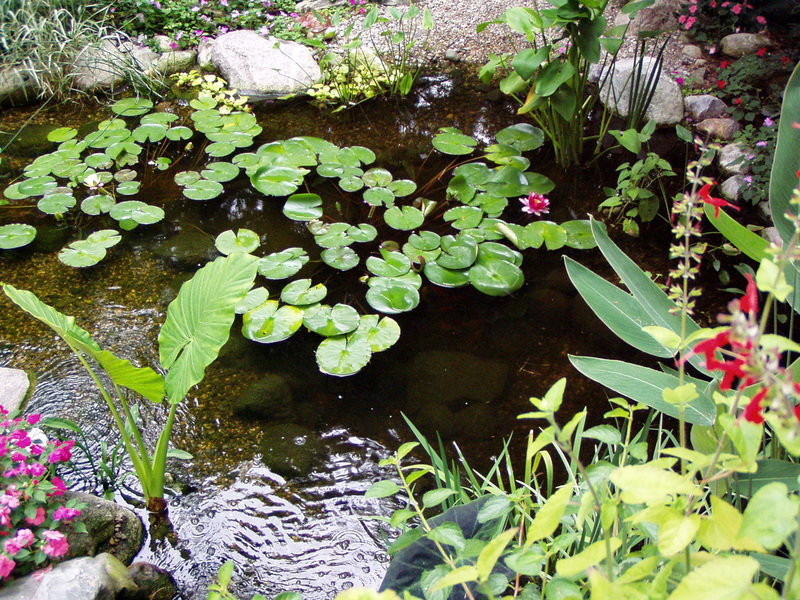 We can do so much more with a pond because of biological filtration and plants. Well, Atlantic Water Gardens National Sales Manager, Jim Chubb and Director of Product Information, Demi Fortuna, both followed that blog post with articles on biological filtration and how bogs work (plant filtration). 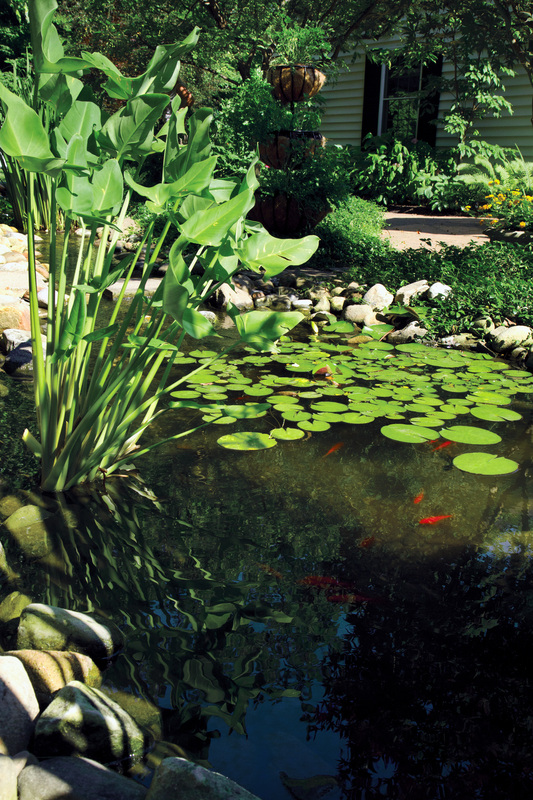 By now you should feel pretty good about how your pond works and how to keep it looking clean, clear, and natural. Some might be even getting ready to ask the follow up question of, “I have done all this, but I still have to do a pond clean out every year, why?” That is not only a good question, but the answer is the next step in the solution to keeping your pond clean and clear as possible. Let me explain, you have set up everything you could to put the water feature on the right path. All the biology is working for you and it is simple to see that the plants growing and out competing the algae for nutrients. You end the summer season happy, coast along until winter and wait for spring. Then what happens? You guessed it, there are algae blooms of every kind and your frustration level is through the roof. You thought you had this covered. What Happened? You probably forgot the last step, harvesting. Huh? Harvesting, what am I a farmer? Indeed you are, or at least you need to be. You see, all that time and attention that you gave led to great plant growth. Those plants are full of nutrients and need to be cut and removed from the water feature before they start to die off and decay in the water. By trimming plants back and covering the pond with a net at the end of the season each year, we are removing nutrients, preventing leaves and other organics from getting into the pond. We are simply getting it ready for the next season. By doing this you complete the cycle and prevent all the nutrients from reentering the pond all at once in the spring. So many water feature owners over look this last step. Yes, they will cut back ugly plants that the cold weather has taken its toll on. But by then the damage has been done. Look at your floating plants, in season they are bright green and beautiful. If you pick one up it has long roots that stretch way out from the bottom to the plant. What is difficult to see though, is that as soon as we see night time temps start to drop, the plant starts to change. First it is the growth rate, then it’s the root system. In a floating plant there are a ton of nutrients in the root system. As it gets colder it starts to drop its roots. When the weather maintains the cold temperature the floater finally starts to turn brown and is usually removed. But it was the root system that did the damage. All those nutrient loaded roots are now at the bottom of the pond decaying and getting ready to spring into action next spring. Your marginal plant do something similar and need to be trimmed as well. So, make a note and be sure to trim plants back before the weather turns cooler, cover with a net to keep leaves and falling debris from getting in there as the season changes. And you will be one step ahead for next spring. This is the number one question I hear as I travel around the country helping people with their water features. Usually there is a problem that brought me to the pond in the first place, but after a few minutes of talking, that question comes up. It is also accompanied with, “I thought this thing was supposed to be low maintenance!” Very quickly I can see that expectations have not been met and a little education is in order. To many times, during the sales process of a water feature, too much time is spent going over flashy marketing brochures instead of just having an honest conversation about what to expect over the first three years of owning a water feature. Many installers shy away from what the maintenance will be due to a fear of scaring off the potential owner. The truth is, there is maintenance to be done, but it’s not any more than anything else in your back yard. So how does your pond work? Your pond works the same way any body of water works whether it’s a 1 gallon goldfish bowl or a seven acre lake. All bodies of water work off of the same basic biology, waste products are created, and bacteria consumes these waste products and converts them into nutrients for plants to consume. With a little maintenance everything will stay in balance and look like a perfect slice of nature. If it is out of balance you will have issues that need addressing. First and foremost Plants are the answer. Don’t let anyone tell you differently. If you have things growing in your water feature that are green and you didn’t plant them and you don’t like them. It’s because you didn’t plant enough green things you do like. Your grass is the same way, if you don’t re seed the yard, “other” green species will start to grow year after year. So the first thing to remember is plants, plants, plants. Secondly, how many fish do you have? What size are they now compared to when you bought them? Fish grow and as they do their new size creates issues in the water feature. If your fish load doubles in size after the first two years but your plant base stays the same, you are out of balance and will have more maintenance to correct the issue. Last of all, water flow and filter size. When your feature was created what fish load was use to size the bio filter, do you have enough water flow to filter the feature at least every hour, preferably much more if you have a heavy fish load. Any of the above can create an out of balance situation for your water feature. There are a multitude of manufactured solutions on the market to aid in this as well. Water clarifiers, automatic dispensers for bacteria, and copper dosing units. Each have their place, and all of them are band aids and not real solutions except for one. Clarifiers only mask the issue, they do clear water, but string algae uses the nutrients and clear water to run out of control. Automatic bacteria dispensers simply take away the need to add bacteria once a week. Truthfully, once the system is in balance this need is reduced as well (more on that in a future blog post). Then there is the copper system (triton ionizer), it works very good, but is a solution for a specific problem and not for every water feature. Some systems have water issues coming out of the tap and are going to be prone to issues not matter how many plants we add. Others are in an area of the yard where sunlight is great for algae but not plants. So it is a great addition if you find yourself dealing with buckets of algae. This is just a quick overview of how your water feature works, for a more detailed look please visit Atlantic Water Gardens University. Welcome to the new Atlantic Water Gardens Blog. We will be bringing you information on all types of water features each month to help keep you up to date on what is happening in the industry as well as what is happening with Atlantic Water Gardens. Don’t worry we will also be including the educational pieces that you have come to expect from us. Our entire Atlantic Water Gardens team will be contributing to this blog in an effort to give you a great variety of topics, as well as sharing our diverse areas of expertise. Demi has been playing in ponds since 1966, building them since 1986, and teaching since 2006. Since his first disastrous but educational foray into water gardening on Long Island in 1986, he has been solidly stuck in the muck of water gardening. As the owner of August Moon Designs starting 1990, he developed an interest in innovative plumbing and large, low-maintenance ponds. Since 2006, he has been lecturing across the U.S. and Canada on pump selection, conservation of resources and pond design. He is now proudly the Director of Product Information for Atlantic Water Gardens, promoting innovative pond equipment and techniques that maximize safety, efficiency and profits while minimizing maintenance, callbacks and costs. Whenever possible, Demi is still tickled pink to work with his sons Edwin and Ely building all sorts of water features, under the strict supervision of the boss, his wife Susan, of course. Sean is our professional fish geek. He got his hands on his first aquarium in 1978 and never looked back. It was the beginning of a lifelong obsession that persists to this day. He has raised just about every type of fish you can have in the aquarium hobby and then some. His love of goldfish and koi came about in 2000. He was managing one of the largest aquarium stores in the Southeast while running his own pond maintenance company. His love and knowledge of fish and water quality has led him to work with the top companies in the country and now he is the Regional Sales Manager of the South East here at Atlantic Water Gardens. His experience in retail, distribution and installation will show through with each of his blog posts. AWG Graphic Designer and Social Media extraordinaire. Shelby will be contributing various tips and tricks that she uses and has found useful when publishing social content and interacting with followers on different platforms. Her continued efforts can be seen on each of the various social media sites as she brings you updates on products and programs from Atlantic Water Gardens. So stay tuned and check in with us each month. But don’t forget to check out Atlantic Water Gardens University and its growing content. Also remember to subscribe to our YouTube channel, AWGtv for the most recent content both in English and Spanish.